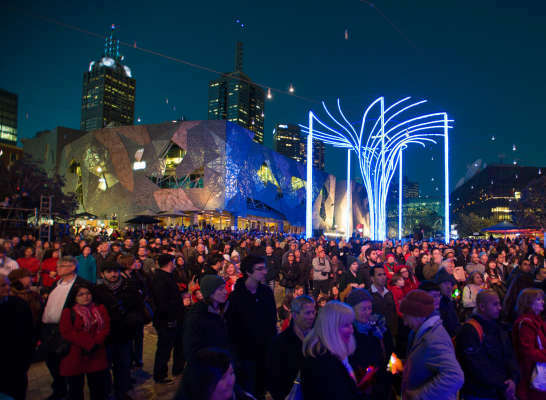 This year The Light in Winter celebrates its tenth anniversary, marking a decade of warming up the heart of Melbourne at Fed Square through a combination of major light-art commissions with hearty community participation. The Light in Winter rejoices in the acknowledgement of the contributions, made by communities of diverse cultural backgrounds, which have made Melbourne the great world city it is today. At the same time, the mid-winter festival is proud to have hosted unique installations by internationally recognised artists such as Rafael Lozano Hemmer, Asif Khan, Bruce Ramus, United Visual Arts, Luz Interruptus, Nathan Thompson and so many more; as well as the participation of local artists and lighting industry creatives. The Light in Winter will open gently on 1 June with the annual Kirra Illuminating Glass Award (KIGA) in Kirra Galleries, and the announcement of the illuminated glass prize winner. On 2 June an opening ceremony will acknowledge the ten years of the festival and its community participants, as they are welcomed once again to Leempeeyt Weeyn’, the Indigenous Campfire which artist Vicki Couzens created for the very first The Light in Winter ten years ago. The fire will be lit that night, in the presence of delegates to the ISPA congress (International Society for Performing Arts), and will remain burning at the front of Fed Square for the whole of the Winter in Fed Square season; the sight and smell of the smoke has become a beautiful marker of the coldest months.